Calling Chicago “a city reborn,” Lori Lightfoot claimed victory Tuesday as the next mayor of Chicago. A former federal prosecutor and a fixture on police-oversight boards under two mayoral administrations, Lightfoot came from the political fringe to stun a field of 13 other candidates in leading with 17.5 percent of the vote in February, and she romped to victory in a runoff Tuesday against Cook County Board President Toni Preckwinkle, who is also chairman of the county Democratic Party. WGN-TV Channel 9 called it shortly before 8 p.m., within an hour of the polls closing. At that point, with almost two-thirds of precincts reporting, Lightfoot led with 74 percent to Preckwinkle’s 26 percent. That lead held up through the night as Lightfoot swept all 50 wards of the city. As someone with an extensive background in police oversight, Lightfoot said she’d build trust between communities and the Police Department, “put an end to this gun violence once and for all,” and halt the “endless cycle of corruption.” Along with stronger public schools, she called those issues key to reversing Chicago’s population drain. In conceding, Preckwinkle lauded how it was a historic race between African-American women and cited their agreement on progressive issues like affordable housing and an elected school board. “That’s historic,” she said. “That’s something to be proud of.” She pledged to “keep fighting” for the issues she stands for as she serves out her term as Cook County Board president. It’s the first elected office for Lightfoot, and she becomes Chicago’s first African-American woman mayor, as well as its first lesbian mayor. But her background in city government is extensive. After serving as a federal prosecutor in Chicago, she held high positions in the Office of Professional Standards, a police-oversight board, and the Office of Emergency Management and Communications. She later led the Police Board, another oversight agency, and was appointed by Mayor Rahm Emanuel to lead the Police Accountability Task Force to overhaul the city’s oversight system again in the wake of the Laquan McDonald shooting in 2014 and the release of the dashcam video late the following year. More recently, the graduate of the University of Michigan and the University of Chicago Law School was an equity partner at Chicago’s Mayer Brown law firm. She’s lived in Chicago since 1986 and now resides in Logan Square with her wife, Amy Eshleman, and their 11-year-old daughter. 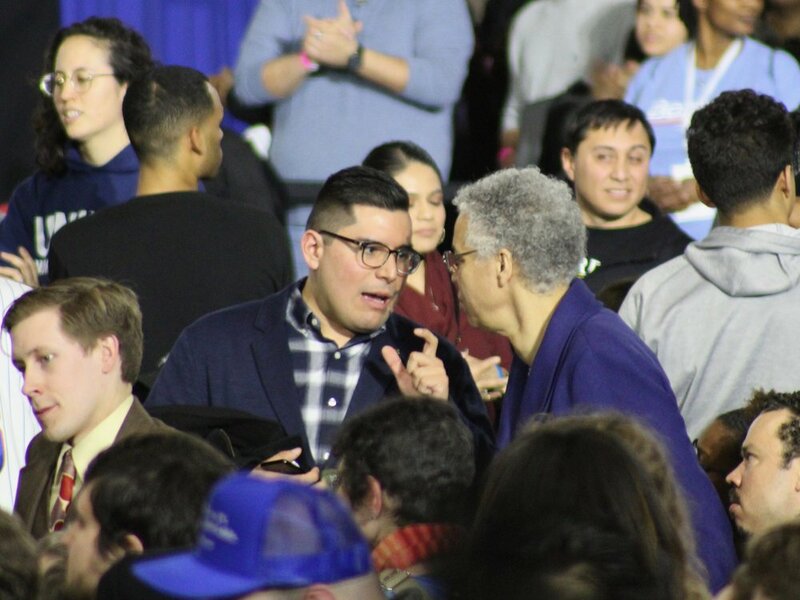 Both Lightfoot and Preckwinkle had progressive bona fides, and their five-week head-to-head campaign was almost tribal in its citywide intensity, with leftists attacking leftists back and forth. Preckwinkle, a former schoolteacher and a 20-year Hyde Park alderman, was elected president of the Cook County Board in 2010 and twice won re-election, most recently last November, so she’ll retain that post. She had the conventional backing of the county Democratic Party and major unions led by the Chicago Teachers Union. She also was supported by Alderman Carlos Ramirez-Rosa, a Democratic Socialist who led local left-wing activists to back her as well. Lightfoot, however, was embraced in the initial campaign by North Side liberals, who provided much of her initial 17.5 percent of the vote, and she broadened her support during the runoff campaign. She earned the backing of state Comptroller Susana Mendoza, who led the city’s Hispanic vote in the initial February election. Lightfoot also won the endorsement of Willie Wilson, who won many African-American wards on the South and West sides. When Lightfoot led with 17.5 percent of the vote in February, followed by Preckwinkle with 16 percent, that blocked William Daley out of the two-person runoff. Seeking to reclaim the dynasty of his father, Mayor Richard J. Daley, and brother Mayor Richard M. Daley, he ran third and missed out. That will no doubt prompt some to seek election reforms to alter the nonpartisan system, perhaps by returning to primaries, perhaps through what’s been called ranked-choice voting. But it should be pointed out that the 14-candidate field, in which no one dropped out in political horse trading and all held their positions with their various factions of city voters, also created the opening for the political newcomer Lightfoot to slip through with her core North Side support and eventually prevail. Alderman Patrick O’Connor, who’d served the 40th Ward for 36 years, at first as part of the 29 under Alderman Eddie Vrdolyak who blocked the reform initiatives of Mayor Harold Washington in what became known as “Council Wars,” lost to Democratic Socialist Andre Vasquez. Incumbent Alderman Deb Mell also lost by the final count to Rossana Rodriguez Sanchez in the 33rd, while Alderman James Cappleman held on against Marianne Lalonde in the 46th Ward — both by margins of less than 100 votes sure to face recounts. State Rep. Melissa Conyears-Ervin won the treasurer race against 47th Ward Alderman Ameya Pawar, who is also founder and executive director of One Illinois. Municipalities across the state held votes Tuesday in what’s labeled a consolidated election. Suburban Cicero voted overwhelmingly in a referendum to call on police officers to wear body cameras, while Wheeling rejected a runway extension at Chicago Executive Airport. Marion elected a mayor who was not Bob Butler for the first time in 56 years Tuesday, as Mike Absher claimed about half the votes to unseat incumbent Mayor Anthony Rinella, a former firefighter appointed mayor after Butler retired in 2018. Carbondale Mayor Mike Henry won re-election. In fact, while Chicago was embracing change, The Southern reported that it was a good Election Day for incumbent mayors across southern Illinois. Springfield Mayor Jim Langfelder won re-election to a second term. The Daily Herald reported that Schaumburg Trustee Tom Dailly was elected mayor, as was Wheaton Councilman Phil Seuss. But the good results for incumbents across southern Illinois didn’t apply to everyone. East St. Louis council member Robert Eastern III upset incumbent Mayor Emeka Jackson-Hicks, and in Cairo former City Council member Thomas Simpson unseated two-term Mayor Tyrone Coleman.